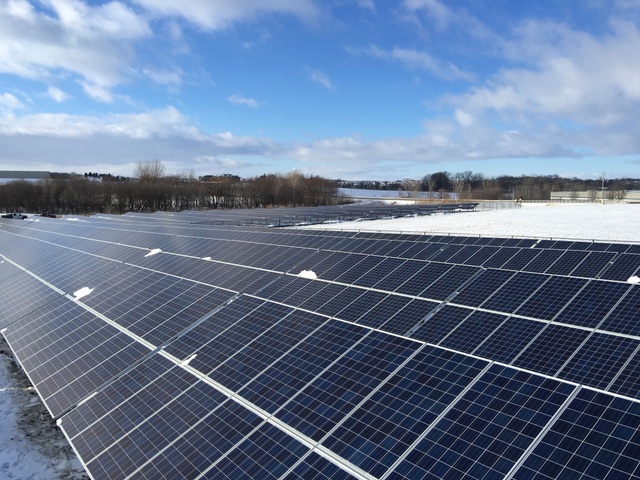 Community solar project in Iowa, courtesy of SunLink. While recent CSS market growth has exceeded that of both behind-the-meter solar like rooftop photovoltaic systems and that of utility-scale solar between 2015 and 2017, barriers surrounding cost, access and demand continue to drag on the CSS sector’s overall growth. The Progress and Potential for Community-Scale Solar report offers new approaches to help drive additional development and buyer adoption of this clean, reliable, locally sourced resource. The report relays data and insights from RMI’s work supporting co-op solar procurement in Colorado, New Mexico and Texas, and focuses particularly on the CSS opportunity for rural electric cooperatives. It follows RMI’s research highlighting levers to reduce CSS costs by 40 percent and enable a 30-GW community scale-solar market—the equivalent of about 50 average-sized coal plants—by 2020. RMI believes the CSS segment sits in an economic sweet spot in the market and represents an economic opportunity of as much as $30 billion. Community-scale systems are large enough to access low costs through economies of scale and small enough to efficiently interconnect into distribution systems. Via these solar arrays — between 0.5 megawatt (MW) and 5 MW per installation, interconnected to distribution networks and sited directly within the neighborhoods they serve —cooperatives can leverage local connections to facilitate the development process, further reducing costs.